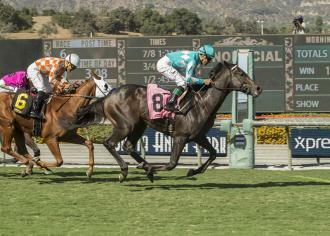 My Boy Jack overcame a four-wide trip on the far turn to rally for a victory in Monday's Zuma Beach Stakes at Santa Anita. ARCADIA, Calif. – The experience My Boy Jack got in his prior starts came in handy on Monday at Santa Anita, when he shook off some early interference and overcame a four-wide trip on the far turn to rally for a victory in the $101,725 Zuma Beach Stakes, a local prep for the Breeders’ Cup Juvenile Turf on Nov. 3 at Del Mar. My Boy Jack ($11.60) had raced four times previously, and though he had never won, he had finished second three straight times, most recently in the Del Mar Juvenile Turf. That encouraged trainer Keith Desormeaux to keep him in stakes company, and My Boy Jack came through on Monday. It wasn’t easy, though. Restrainedvengence, who started from the inside, bore out badly around the first turn and caused several horses, most notably My Boy Jack, to move to the outside to avoid him. My Boy Jack wound up about four paths wide, and though he continued to race wide the rest of the way, he had a wicked pace into which to rally. For Him carved out fractions of 22.45 seconds for the opening quarter and 45.62 seconds for the half. My Boy Jack, eighth of 10 down the backstretch, advanced quickly entering the lane, then put away Count Alexander and Armour Plate in the final furlong to prevail. He was timed in 1:33.84 for one mile on firm turf. “That’s got to be one of the stronger races in the division,” Desormeaux said. My Boy Jack won by three-quarters of a length over Count Alexander, who was favored at 8-5. Armour Plate was another half-length back in third, then came For Him, Kazan, Kylemore, Restrainedvengence, Cono, Mantracker, and Trusting Friend. Big Buzz and Brave Helios were scratched earlier in the day. Desormeaux’s brother, Kent, was aboard My Boy Jack. My Boy Jack, a colt by Creative Cause, is owned by the Don’t Tell My Wife Stables run by Kirk Godby, and the Monomoy Stables LLC partnership that includes Sol Kumin. He earned $60,000 for his victory on Monday to push past the $100,000 mark for his career. A bigger payday will be sought in less than a month. My Boy Jack will return to Del Mar for the Breeders’ Cup Juvenile Turf, to be run over the same course and one-mile distance at which he finished second twice during the summer meet. Among his rivals will be Encumbered, who won both those races but then ran on dirt in the Grade 1 FrontRunner the first weekend of the meet here instead of the Zuma Beach.